As a mom of two, one being a newborn I’m always looking for solutions to make life easier. Anything that makes helps me to complete any task in record time is a winner in my book and one pot dishes usually does the trick. 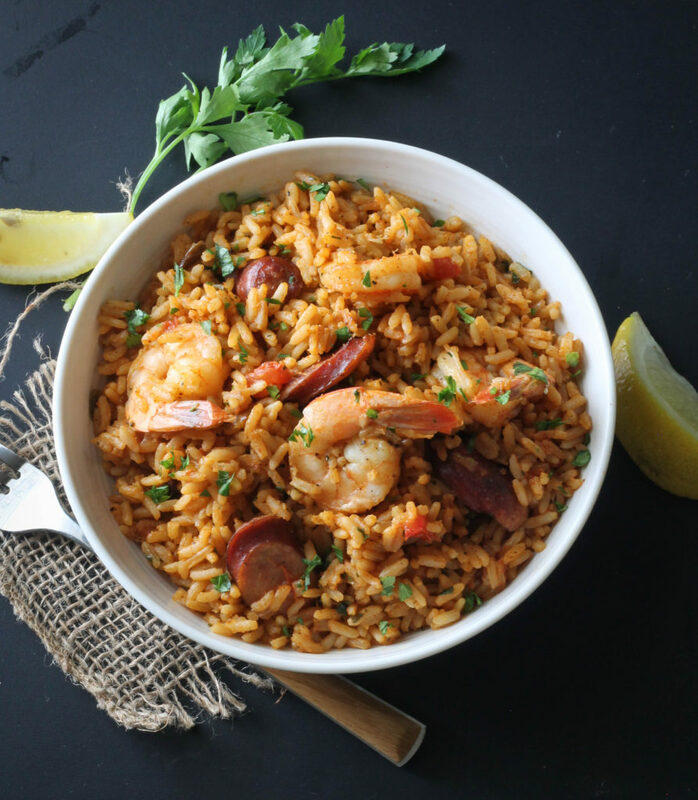 I love one pot dishes and have shared a few in the past, like my Guyanese Black Eye Peas Cook Up, Chicken, Shrimp and Chorizo Pelau, One Pot Pesto Pasta and Arroz Con Pollo; some are a bit more complex than others but regardless of how long it takes to prepare, one thing that these dishes all have in common is that they are delicious and always a family favorite. I picked up a box of Zatarian’s Jambalaya Mix and Lawry’s Seasoning Salt from Walmart with the intention of making a pot of Jambalaya without all the fuss. 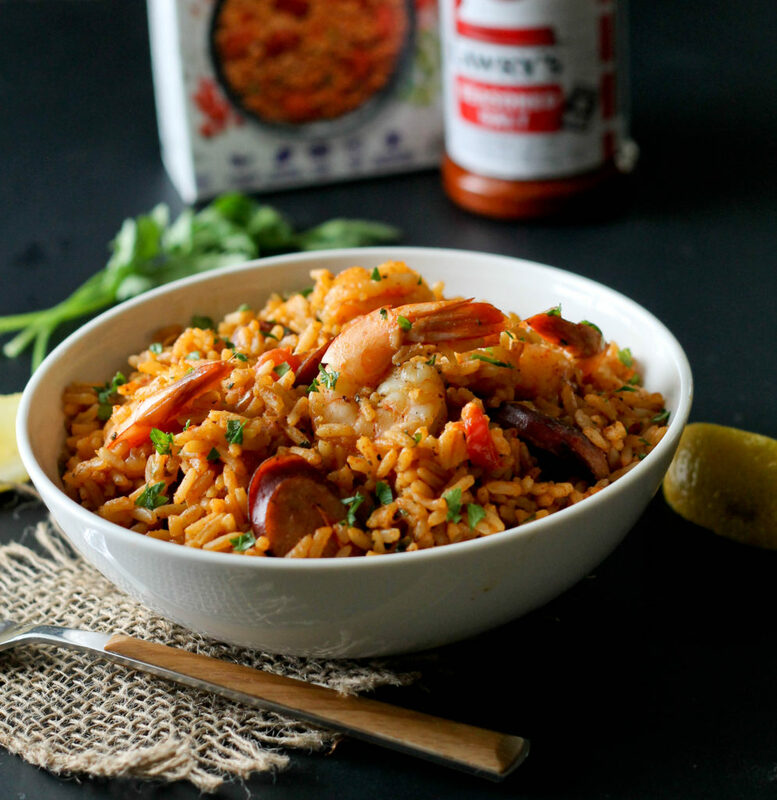 I’m sure you’ve seen Zatarain’s on the self of your local supermarket before; they offer a wide variety of products such as rice mixes like dirty rice, yellow rice, gumbo mix and other products like fish fry, hot sauce and meals ready to eat in minutes! What’s great about Zatarain’s mixes is that they are made with no artificial flavors, coloring or MSG. We’ve all been there when we have a craving for a specific dish but either don’t have the time or don’t want to spend too much time in the kitchen and that’s where Zatarain’s comes in; all of the seasonings are already in the box which makes whipping up a dish super easy and the fact that most varieties are gluten free is a plus! I’m an avid Walmart shopper and usually rely on Walmart for my groceries and other house hold items. It’s super convenient and now Walmart offers online grocery pick up! Simply head to the website, select your groceries and personal shoppers will do the work for you and have you’re groceries bagged and ready. All you have to do is head to the store and pick up your groceries and the best part is that this service is free. I also love the free 2 day shipping and that they also offer a pickup discount where you can order online and pick up in store and receive a discount on selected items for using this service. I love that there are so many shopping solutions, including the Walmart pay, I’ve used this in the pass and it makes check out a breeze; just have the app scanned and it pays with the card attached to your account and stores your receipt. This came in handy when I lost a receipt and needed to return an item, all of the information was stored in my app. Being that I’m a fan of Walmart, I’m excited to announce that I will be at Walmart on Saturday June 10th in Stockbridge (5600 N. Henry Blvd) to celebrate the Road to Essence! Join me in the red and white Lawry’s and Zatarain’s tent from 12-3pm where I will be offering tips and solutions as well as giving out delicious samples using Zatarain’s and Lawry’s products. 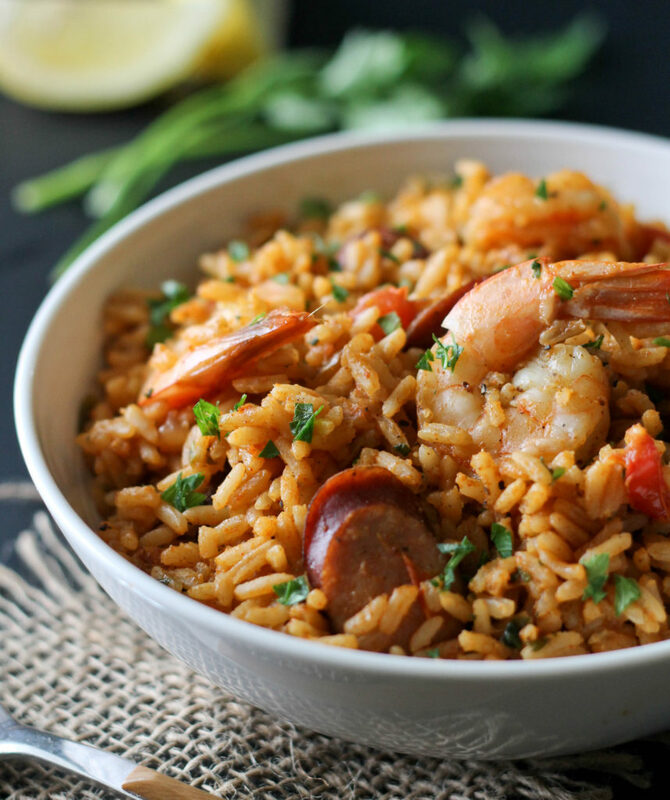 Now on to this super easy Shrimp and Sausage Jambalaya, this dish is packed full with flavor and will appeal to your taste buds if you love spicy foods. I chose the family sized box because it was the perfect amount for my family and added shrimp and sausage because it’s everyone’s favorites but you can use chicken instead. 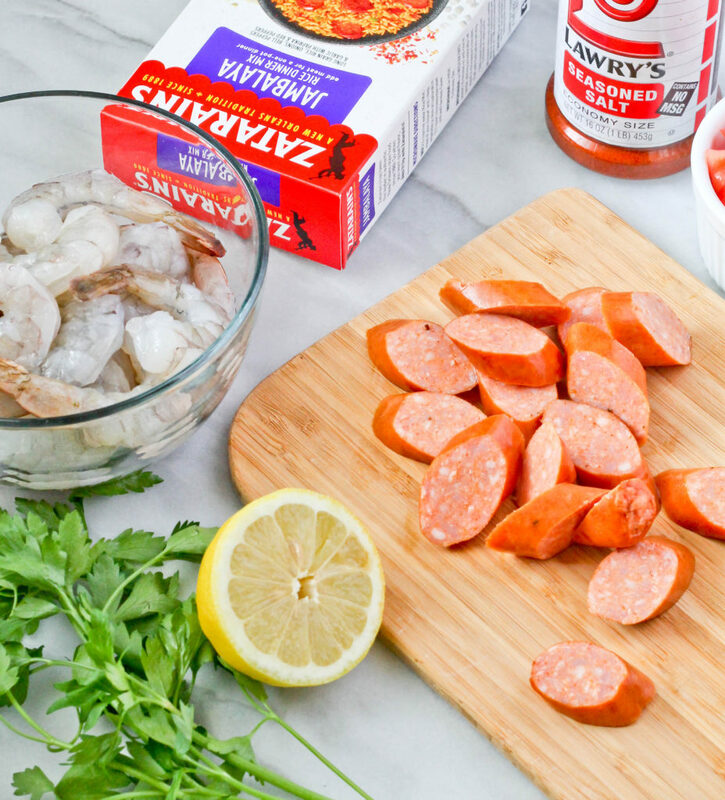 Mix shrimp with Lawry’s seasoning salt, black pepper and lime juice in a small bowl and set aside. Place oil in a large pot over medium heat. When oil is hot, add sliced sausage and brown. Remove from the pot and set aside. Add onion to the pot and cook until is softens, about 2-3 minutes, then add tomatoes and cook for about 5 minutes. Add Zatarain’s jambalaya mix, sausage and chicken stock. Stir the pot well then bring to a boil, then lower heat to a simmer and cover pot. Cook for 15 minutes, and then add seasoned shrimp. Cover and allow to cook for an additional 10 minutes until the shrimp is pink and all of the liquid is absorbed.